About The Artist: For over thirty years acclaimed writer, singer and guitarist James Hersch has been quietly building a repertoire of work that puts him squarely on the forefront of acoustic music’s importance in North American culture. James has a rare mixture of straight forward musical talent, humor and sensitivity that allows him to create songs that speak to what is common in all of us. He is one of those few performers who allow his listener to experience his music through intimate images which confront and celebrate today’s human condition. Although James has a Bachelor of Arts degree in classical guitar, his song writing is based on common themes that are broadly appealing. Hersch performs as a solo acoustic artist and his music has taken on a life of it’s own, deeply planted in the minds of the thousands who hear him each year. A native Minnesotan, Hersch has twelve album credits to his name, including two children’s recordings and two musical scores for documentary films. 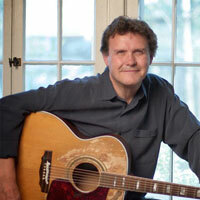 He recently received a “Telly Award” for his original music in “Paving the Way”, seen on PBS stations nationally. His compact disc releases include songs about the farm and the city, the school teacher and the paper boy. In 1997, he was selected by the National Association for Campus Activities to be the recipient of it’s annual Harry Chapin Award for Contributions to Humanity. He has also been nominated National Coffeehouse Entertainer of the Year several times by the NACA, and has been a finalist at the international Kerrville Folk Festival. REACH WITH ME, an outreach residency program Hersch founded in 1994, has become a favorite among colleges and communities nationwide.